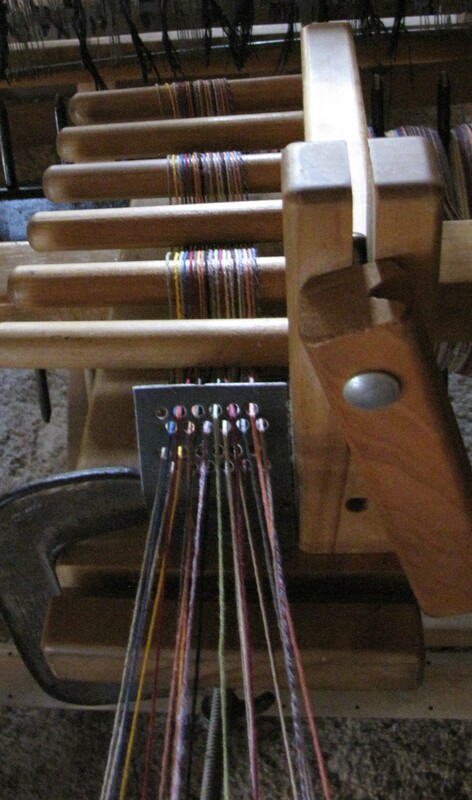 Each thread must be tied onto the correct thread from the previous warp. 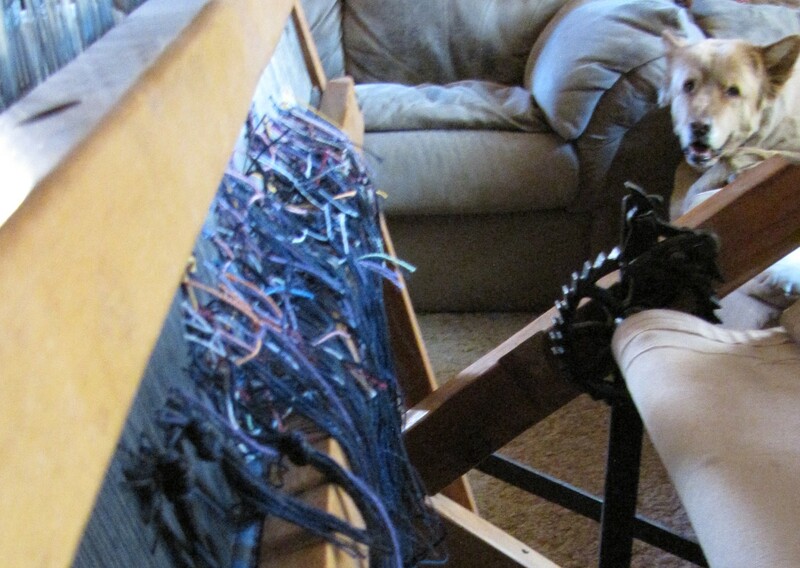 Once you have warped your loom, there is the next chore of tying on. 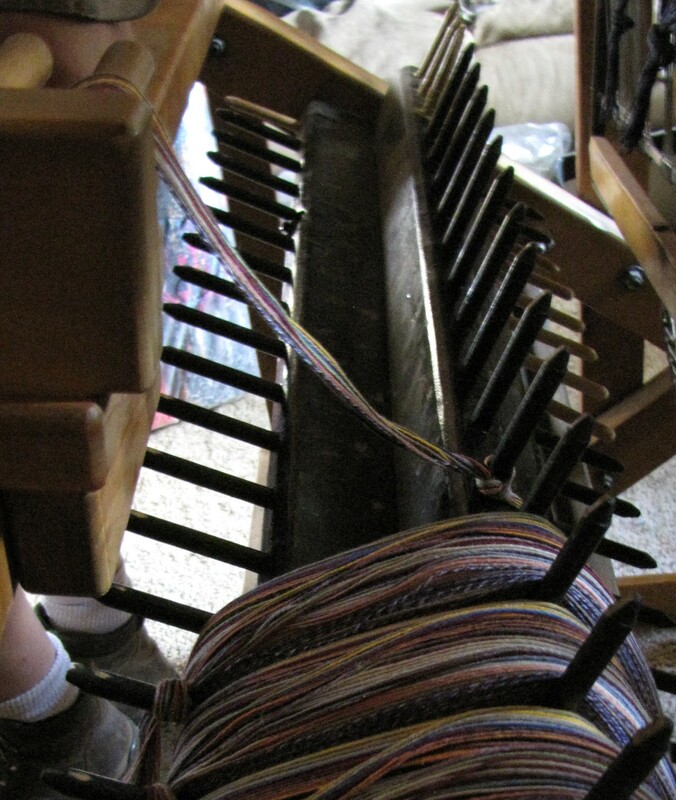 If you read Warping the Loom, then you know we have a Union floor loom for rag rugs. 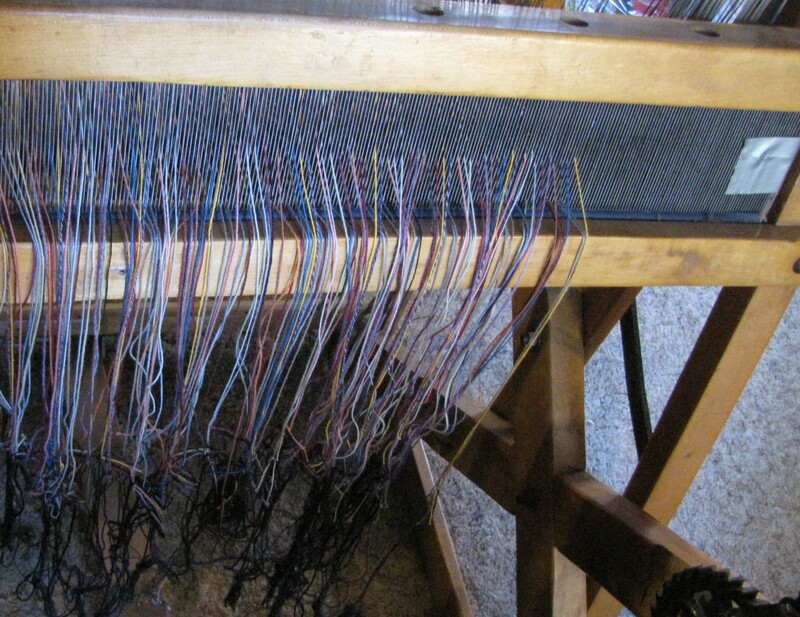 This loom came to us with about 10 rugs worth of black warp on it, set at 32 inches wide. The new warp is much brighter and set at 28 inches wide. Here in this post I will reveal to you all the mistakes we made; experienced weavers may snort laugh a little. That’s fine; we do. First off, the threads should be tied on in the same pattern you had them on the spool rack. It’s best to keep this pattern for each section, though a few mistakes won’t kill your warp. Each individual thread from the new warp needs to be tied onto the correct one from the old warp. 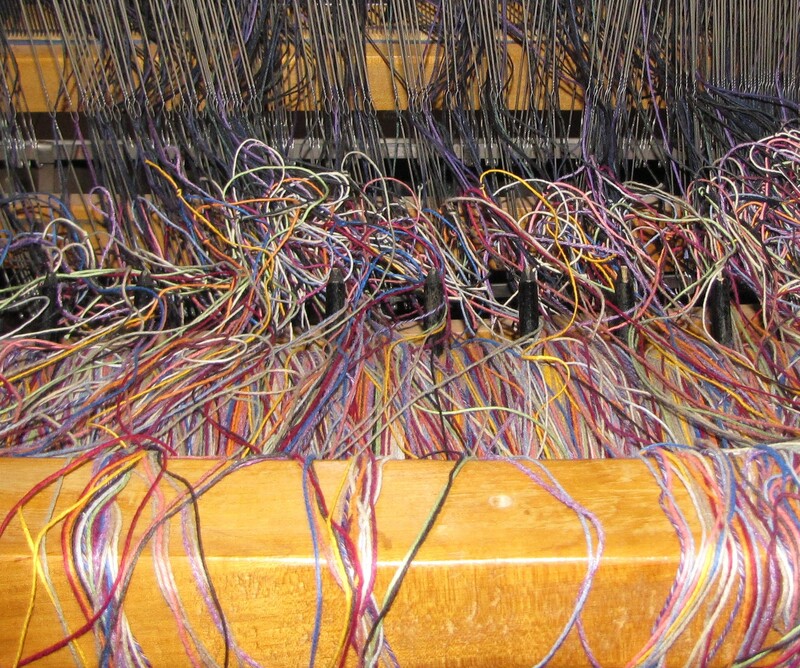 We had left the old warp threaded through the two harnesses and the reed. In retrospect, I wish I had not cut them as short as I did as leaving the old warp about 16 inches long caused for a lot of pulling and inadvertently pulling the warp completely out in a few places. The alternative is to pull the old warp out completely and just re-thread everything. If you have a sley hook (aka threading, heddle, or reed hook), this might not be too bad. I do not have a sley hook. 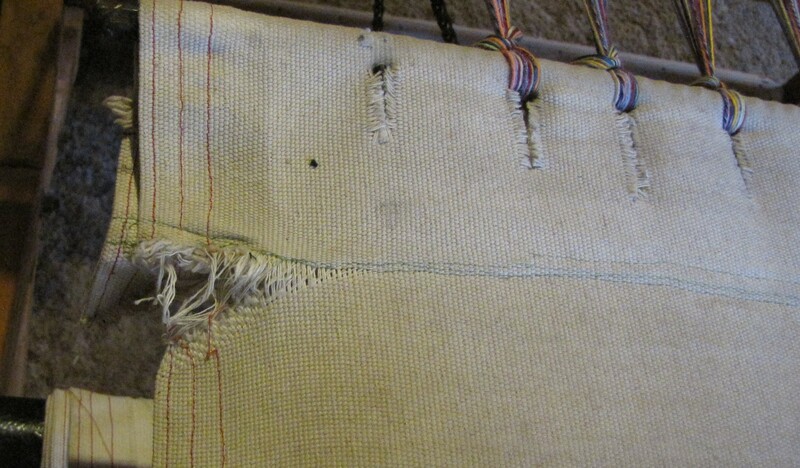 This is also what you would do if you have warped your loom for the first time and don’t have old warp to tie on to. Our loom is a 2 harness loom. So, the threads must alternate. It doesn’t matter if you start with the back harness or the front harness; just keep the threads alternating. You do not want two threads side by side in the same harness as this can lead to a visible line the length of your rug. Typically, you just follow the pattern set by the previous warp, correcting any mistakes as you go, trying not to introduce new ones…..like some blogger you may know ;). In tying on, use an overhand knot, not a square knot. Square knots come undone under tension and you will be cussing mightily as one after another pops loose. The overhand knot will only get tighter under tension. This is really more important for when repairing a broken thread. The knots you tie here for tying on the new warp will most likely not be under any tension, but I try to get myself in the habit of using the overhand knot instead of the square knot. At 20 threads per section, 14 sections, that’s a lot of knots! So, I was going from a wider warp than the new one I had just put on. This meant that I had to drop a section of the old warp on either side. The problem was that the old warp was mostly black and I could not tell where the section ended with ease. In retrospect, I could have simply counted off 20 threads, as I know that is what is in each section. Alas, I had left the wee tiny OCD bit of my brain locked in the canned vegetable cupboard to do some organizing. I really should have invited it to the tying on party. So, that was mistake number one. I was off by a number of threads and this became noticeable towards the end. Thankfully, with this model loom, there was an easy fix that my mom clued me in to: the reed has a little bit of wiggle room and simply by loosing the bolts on the reed bar and sliding the reed down ~8 threads, this problem was solved. My second mistake was really a beginner’s mistake. In fact, I was a bit embarrassed over this one and didn’t even tell my mom. Now, she hasn’t discovered this little website of mine yet, not being particularly computer savvy. I’m sure I can trust you all to keep it on the hush-hush, right? OK, I tied on 3 sections, 60 threads, straight to the old warp without taking the threads over the back beam. Yes, round of applause. Did I grow up with a weaver for a mom or not? I was quite exasperated with myself when I figured it out. True, I was paying attention to an audiobook, but …..Yeah, invite that OCD part of yourself to the tying on party. Now, there was an easy fix to this one too. Yes, it involved a wrench. Bill simply unbolted one corner of the back beam and swung it in enough to wrap the warp around it as it should be, then rebolted the beam. Took like 2 minutes. Here, we have puled the new warp through. My dog Tanuki is supervising. While tying on to the old warp, I found a few mistakes that had to be corrected. The first one was that two threads were going through the same harness eyelet. Oops! 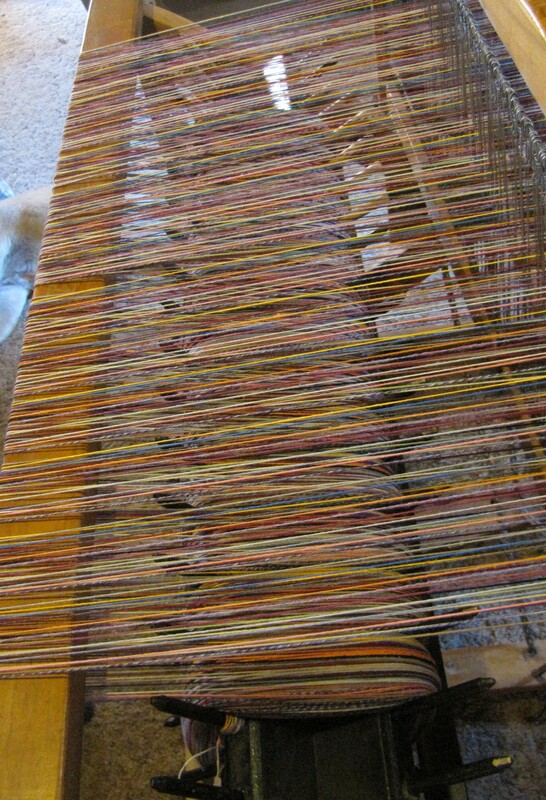 Mistakes get introduced to a warp through the course of weaving. Typically, a thread breaks for one reason or another, and it can pop all the way to the back beam if under tight enough tension. So, mistakes happen while re-threading that broken string back through when you tie it back in. I’m sure I will be introducing mistakes to my current warp and when I re-warp in a few weeks, I will be finding and fixing those mistakes too. For this double threaded eyelet mistake, I continued to just tie on and when I finished tying on the entirety of the new warp, that was when I fixed it. There may be more mistakes exactly like this. To fix it, keep tract of how many doubles you have, then simply move your warp thread by thread out towards the edge that many number of eyelets and dents. (Dents are the spaces in the reed that the threads go through. Yeah, I didn’t know that either until I was doing this tie on by myself and calling my mom every 2 hours with questions.) In my case, I had only 1 double, and it was located in the first section I tied on, so I only had to move a few threads over 1. When you do this, you need to make sure you keep the threads alternating front and back harness. If you have a 4 harness loom, same principle, you just need to pay extra attention. The next mistake I found was that three eyelets were completely empty. Ooops. This was all me. I must have accidentally pulled the old warp out. So, I had to take the appropriate 3 threads of the new warp and unwind those three from the back beam enough to make it all the way through eyelets and dents. Once I got those three all the through, I went ahead and tied them together in front of the reed so they wouldn’t be tempted to pop back through to be with their friends. Success! Ready to cut off the remaining old warp & tie on new warp. The next was an odd one: I found a thread going through a back harness eyelet, an empty front harness eyelet, and then the next thread going through a back harness eyelet. Yet, there was not a blank space in the dents. If there had been an empty space in the dents, I would have done the same thing as in the previous mistake, just with a single thread. In this case, I pulled one of the back harness threads (old warp) out of it’s eyelet and put it through the front harness eyelet, making sure to preserve my alternating. Then I continued to tie on the new warp as I had been doing. Yes, this left an empty eyelet in the middle of the warp, but it won’t cause a fuss. Now that I had my warp tied on (14 sections at 20 threads a piece), all 280 threads, I was ready to pull the new warp through. The front of the loom still shows the old warp (black threads), so I grabbed those in perhaps 40-60 thread bundles and gently pulled. To get all those knots through the eyelets and dents, some wiggling, jostling, and even cajoling of the threads must be done. You don’t want to break any of them; you just spent how many hours hunched over the back beam, squinting and counting and redoing your work? So, go with the cajoling, even a few epithets if you feel strongly about it, but do not break your threads at this point. There will be plenty of time for that later. The new warp is tied onto the apron, ready for weaving. Once the new warp was pulled through, I pulled a few extra inches through the give myself some thread to work with. I cut off the old warp and all my knots. Yes, hours spent putting those knots in only to cut them off later. Perhaps I can find some arts & crafts class that can use such silly bits of thread? Anyway, now I had my new warp ready the be tied on. For the apron on my loom, I have tie on slots for each section on the back beam. So, I grabbed the first 20 threads (first section) at one end and tied it on. Then I went to the opposite end and did the same thing. I bounce back and forth while tying on and once all sections are tied on, I tighten down each section by hand. Once satisfied that my tension is even, I usually tighten it up a bit with ratchet. Now I am ready to start weaving. There’s some minor wear & tear to this apron. I took a picture of one edge of the apron to show how it is wearing. My mom made this apron for this loom and when she makes an apron, she gives it enough material to wrap around the front beam 3-4 times. This means that once I have too much wear on that edge (like it is messing up the tension on one side of the warp), I can simply cut off the damaged section, sew a new loop for the rebar, and put in new slots for each section to tie on to. If you have a factory or store bought apron, you may not have enough excess material to do this and will have to replace the whole thing. If you can sew straight lines on your sewing machine, you can make yourself an apron out of heavy canvas material and save yourself some trouble down the line. This is the new warp as seen on the back beam when under tension. This is a simple spool rack used for warping. There was some cursing, I’ll admit. While I grew up assisting with all things weaving, including warping a loom, I had never attempted it without supervision. Well, that is exactly what Bill and I did a few weekends back. Luckily, the camera was handy to document our attempt (perhaps folly is a better word). We borrowed the warp stand and tension box from my mom, put on some Sherlock, and hoped the dogs would be lazy and show zero interest in our doings. The spool rack is a simple rack that holds the warp thread in the order you want. We have an older Union loom that has holes for small dowels or large nails along the bottom bar below that back beam. You don’t need a spool rack if your loom is set up to hold the warp thread on the bottom bar. However, my mom assures me that the rack is a better choice and eliminates the risk of bonking ankles into nails. See, less cussing. So, the center bar can be lifted, pivoting the metal crossbars out so that the thread can be loaded. You’ll see that I have two larger spools at the top. I on purposely left a blank place in between those large spools and the next spool; this reduces the chance of tangling the warp as it is pulled off the spools and onto the back beam of the loom. Also, I chose a distinctive thread to start the warp. This makes it easy later on to capture the 20 threads that belong in each section while tying on. I chose some strong colors for this particular warp. I had a mix of shag rugs and sock rugs to weave. On the shag, the warp, no matter what you pick, will not affect the color of the rug too much. Now, on the sock rugs, the warp can make a difference. So, I had a few things in mind: 1) I had an orange, yellow, and red sock rug to weave up; 2) Tis the season for bright colors (summer); 3) Northern NM is a fire, like forest fires, and this influenced my color selection. The previous warp had been a nearly all black warp, so you could say I was lightening things up a bit. When I get around to weaving cottons or blue jeans, I will probably put on a lighter warp – lots of natural off-whites, beiges, light yellows, etc. with the occasional vibrant thread. In order to maintain the same tension across the back beam, from first to last section, start with a mix of full and half-full spools. Obviously, you will need to replace the half-full spools as they are used up. So, make sure you have multiple spools of the same color to replace them as needed. And replace with full spools so that by the last section you warp will have some partially full spools and some spools that are still mostly full. If you start with all full spools and end with all spools nearly empty, you will have different tensions on the first section versus last section. From the warping stand, the threads go through a tension box. With the spool rack loaded, we threaded through the tension box, which clamps to the back of the loom. First, through the little holes, making sure that as your threads pull off the warping stand they are not tangling or crossing over one another. Then under and over the thick dowels towards the back beam. Tie onto a peg and you are ready to start winding on. Now, this is a two person job. Some looms have a handle specially made for just this task. We had a wrench and duct tape. I also took a bit of very bright yellow thread and tied it to the peg nearest me to assist in counting. Bill had the first shift of making sure the warp went on even and changing out spools as they ran out. We had decided to put on 75 turns on my 18 inch diameter beam. Basically, this will give me perhaps 20 rugs on this warp. 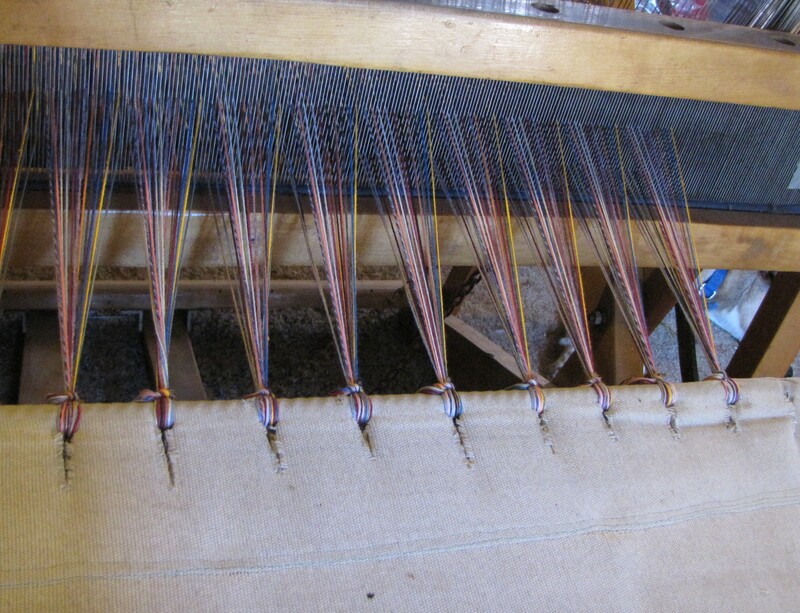 The back beam on this loom can accommodate 140-150 turns, which would be twice the number of rugs. But this also requires twice as much warp and I didn’t have that available in the colors I had chosen. We were also going from a 32 inch wide warp (the old black warp) down to a 28 inch wide warp. Each section is 2 inches wide in warp, so we simply dropped 1 section off either end. I counted as I cranked, starting off slowly. Bill watched the warp go on, gently adjusting it with his fingers as needed. His job also required that he pay attention to the pegs on either side of the section, making sure none of the threads got caught on the pegs, or skipped over to a neighboring section. Basically, you want the warp to evenly take up the entirety of the section. You don’t want it to build up on one side or the other, creating a ditch. This leads to uneven tension later on. Once I got to 75 turns, I added 1 more just to be sure. We then cut off, and tied onto a peg and tucked in the ends. We both kept eyes on the spools. As one was nearing its end, I would slow down my turns. Having to dig the tail-end of the thread out of warp because you missed it 2 turns back is a pain. Luckily, this is one mistake we didn’t make this time. Also, sometimes spools can suddenly lock and you might break the thread. Again, we avoided this error. Don’t worry, we made plenty later on with the tying on. Anyway, the thread coming off the spool can get tangled on the metal dowel it rests on. Sometimes, towards the end of a spool, the end of the thread will be tucked in to the wound thread and get tangled on the thread coming off the spool, causing it to lock. The same number of turns (hopefully) go onto each section. Once a section is done, you simply loosen the clamp of the tension box and scoot it down a little and reclamp. Eventually, you will have to move the warp stand down too, but this usually is only necessary 1-2 times on a little loom like mine. We swapped about halfway through, as either activity can mess with your back. We were both rusty. Bill kept forgetting to count and I kept pushing the threads over too far, causing them to skip out of their section. In Bill’s case, we simply put warp on until it looked even with nearby sections that we did do a count on. On my mistake, I would have to ask Bill to stop turning and then retrieve the errant threads going back to where they jumped, put them in the correct section, and pull those few threads taught back to the tension box. Finally, we completely ran out of 1 color on the last section. We were perhaps 2/3 of the way done with this section, so we substituted the closest match we had. It happened to be a black for a deep burgundy. This won’t be particularly noticeable woven up and just nosy expert weavers and you all will know about. With the supplies put away, we were now ready to tie on, which I will go into in another post.